If you’re one of the rare people that eat several servings of nonpredatory fatty fish per week, or if your diet contains large amounts of alpha-linolenic acid, then you may not benefit from taking a fish oil supplement. If you’re like most people, though, and you don’t eat much seafood or high amounts of vegetable or nut oils, then you can rest assured your plasma EPA and DHA levels are lower than you want them to be. If you want to optimize your mental and physical health and performance and reduce the risk of disease and dysfunction...then you want to try TRITON today. When it comes to maintaining optimal health, preserving physical and mental performance, and warding off disease and dysfunction, some nutrients are far more important than others. For example, it was once believed that vitamin D was important only for bone health. Magnesium is another example of a vital nutrient. Two other nutrients crucial to our all-around health and well-being are eicosapentaenoic acid (EPA) and docosahexaenoic acid (DHA). The reason the average Westerner gets so little EPA and DHA is his primary source of these life-preserving molecules is a type of dietary fat called alpha-linolenic acid (ALA). ALA, which is abundant in certain foods like vegetable seeds and oils, can be converted into EPA, which can then be converted into DHA. All this isn’t exactly news to many people, which is why fish oil supplements are more popular than ever. Which Type of Fish Oil is Best? A triglyceride is a molecule comprised of three fatty acids and one molecule of glycerol, which is a colorless, odorless substance found in fats and oils. The ethyl ester form of fish oil is created by processing natural triglycerides to remove the glycerol molecules and replace them with ethanol (alcohol). This is done to remove impurities and concentrate the fish oil, thereby raising the levels of EPA and DHA per gram of oil. While this may sound positive (and is often touted as a selling point), and plenty of studies have proven the benefits of supplementation with fatty acid ethyl esters (FAEEs), it’s not without drawbacks. The reesterified triglyceride form is similar to the natural form, and it’s created by using special enzymes to convert ethyl ester oil back into triglyceride oil. This adds expense but improves the quality and bioavailability of the oil. Out of these three forms, you would probably assume that a natural triglyceride supplement is your best choice. Well, ironically, natural triglyceride oils can also have much higher levels of contaminants than ethyl ester and reesterified triglyceride oils (due to the low level of processing). Furthermore, natural triglyceride oils are often low in EPA and DHA when compared to ethyl ester and reesterified triglyceride oils, which means you have to take more to see results. For example, you’d be hard-pressed to find a high-quality triglyceride oil that provides more than 1,200 milligrams of EPA and DHA per 5 grams of oil (and fat). This is expensive both in terms of dollars and calories. It has very high concentrations of EPA and DHA. It has very low levels of toxins and pollutants. It has none of the potential side effects associated with supplementation with ethyl ester oils. Not many companies sell reesterified triglyceride oils, though, because they’re the most expensive to produce (they cost 30 to 40% more than ethyl ester oil). What Аre You Actually Getting for Your Money? Another important factor you have to consider when choosing a fish oil is how many milligrams of EPA and DHA are in each serving. Lower quality supplements might have as little as 150 to 200 milligrams per pill, which means you would have to take a handful every day just to get enough omega-3s. This isn’t just a hassle—it also means swallowing anywhere from 10 to 15 grams of fat per day that you won’t get to eat (and enjoy). This product costs about $11 and, as you can see, contains 100 pills of 300 milligrams of omega-3 fatty acids. Thus, you get 30 grams of omega-3 fatty acids per bottle, meaning you pay about 37 cents per gram of EPA and DHA. TRITON, on the other hand, costs $35 and contains 120 pills of 600 milligrams of superior, reesterified triglyceride omega-3s, for a total of 72 grams per bottle. That comes out to 49 cents per gram of EPA and DHA, which means TRITON gives you the highest quality fish oil you can buy for only slightly more than the lowest quality products on the market. And when you compare TRITON to other reesterified triglyceride oils, you really see how good of a deal it is. As you can see, it’s a good product. When you do the math, though, you also see that it’s very expensive. ...for $50, or 65 cents per gram of omega-3s (33% more than TRITON). We have cut out the middle men involved in retail sales (that each need their cut) and sell direct to you, the consumer. Thus, we’re able to offer you more for less. Now, you’ve probably heard that fish oil supplements can be harmful to your health due to contamination with various toxins and chemicals. What About Contaminants in Fish Oils? There are many man-made chemicals that tend to persist in environments and accumulate in organisms. Limiting our intake of canned foods. Opting for natural cleaners instead of chemical ones. We should also watch the fish we eat and fish products we consume. This is why the National Institute of Environmental Health recommends that we avoid fish like king mackerel, swordfish, and bigeye and ahi tuna, and limit our intake of fish like grouper, sea bass, and white tuna. Instead, we should opt for “cleaner” choices like cod, halibut, skate, and snapper. Thus, if you’re going to take a fish oil, you want to ensure it contains as little toxic chemicals as possible. The fish the oil was sourced from. How the oil was processed. We recall that 100% natural triglyceride oil can contain higher levels of contaminants than more processed oils like ethyl ester and reesterified triglyceride. Ideally, your fish oil supplement would both be sourced from low-toxicity fish and processed to remove impurities using the latest and most effective methods. How Аre the Fish Harvested? Several common fishing practices are extremely destructive to the natural habitats of the fish. For example, “bottom trawling” involves dragging large nets fitted with rubber tires or rollers along the ocean floor, including coral reefs, where fish congregate. The problem is these rollers can be very large and very damaging to the delicate coral ridges they pass over. According to the World Wide Fund for Nature, scars up to 4 kilometers long have been found in reefs off the north-east Atlantic Ocean. In heavily fished areas off southern Australia, 90% of the surfaces where coral used to grow are now bare rock. Two other ways reefs are destroyed are cyanide and dynamite fishing, which are exactly that: the use of cyanide and dynamite to catch fish. Cyanide stuns fish but doesn’t kill them, making them easy to collect. It also kills the organisms that grow on the coral, transforming the vibrant “rainforests of the sea” into marine deserts. Fish killed by dynamite float to the surface where they can be simply scooped up. It also reduces underwater environments to rubble. Overfishing is another harmful practice that bites the hand that feeds. It makes for good paydays but can take wildlife from the sea faster than they can replenish through reproduction. For example, Chilean seabass became so popular in the 1990s that in the early 2000s it faced commercial extinction. This prompted hundreds of chefs to band together in opposition to serving it in their restaurants. We don’t need to destroy ecosystems to get our food and supplements, and as fish oil consumers, we can make a difference by supporting well-managed, sustainable fisheries. Sustainable policies and methods include prohibiting fishing around reefs, regulating how certain fish can be caught (rod and reel or harpoon, for instance), how large fish must be to be removed from the ocean, and how much tonnage of individual fish may be caught each year. Take 2 softgels twice daily with meals. For optimal results, take every day. Check with a qualified healthcare professional before using this product if you are under 18 years of age or if you have any pre-exisiting medical conditions and/or are taking any prescription medication(s). 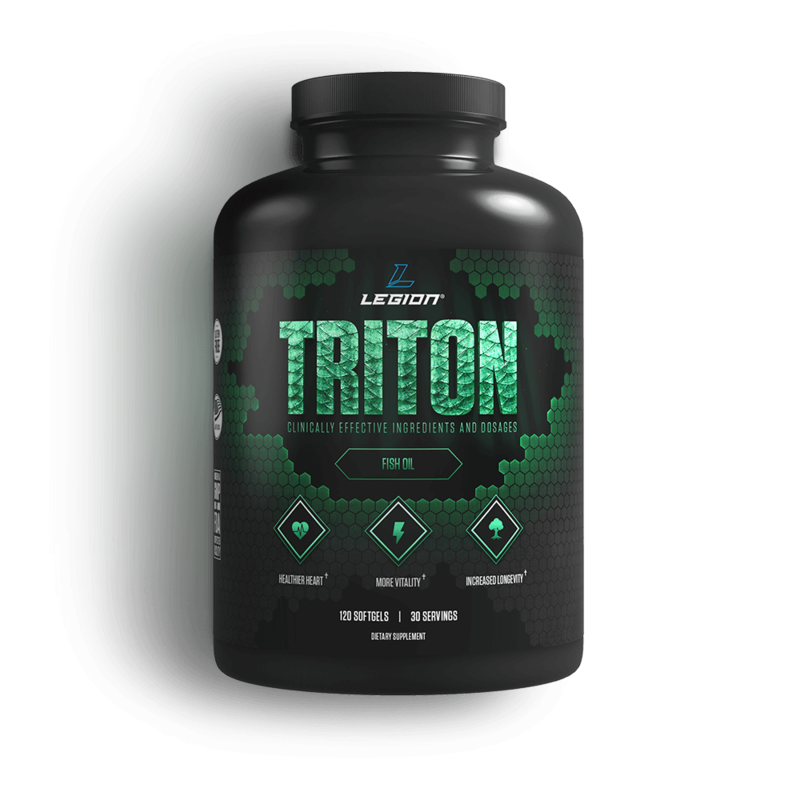 Will TRITON help me build muscle or lose fat faster? Remember, though, that no amount of pills and powders can give you the body you really want. Supplements don’t build great physiques--dedication to proper training and nutrition does. That said, some can help you get there faster, and fish oil is one of them. How quickly will I see results with TRITON? That depends on your current EPA and DHA status and on how your body responds to changing it. For example, some people experience noticeable benefits within the first week of starting TRITON and others notice only slight improvements after several weeks of supplementation. Keep in mind, though, that this isn’t a supplement you take for its acute benefits. This is something you take to benefit your long-term health, performance, and longevity, which you know is happening whether you “feel it working” or not. What’s the shelf life of TRITON? My bottle smells fishy. Is the oil rotten? Fresh sardine and anchovy oil just has a slight odor. And just in case you were wondering, the oil in TRITON is as fresh as you can get--it goes from the boats to the processing plant to the softgels to you. You usually can’t smell the oil through the gels, but they can burst while being prepared for bottling, coating batches in a slight film of oil that you can smell. 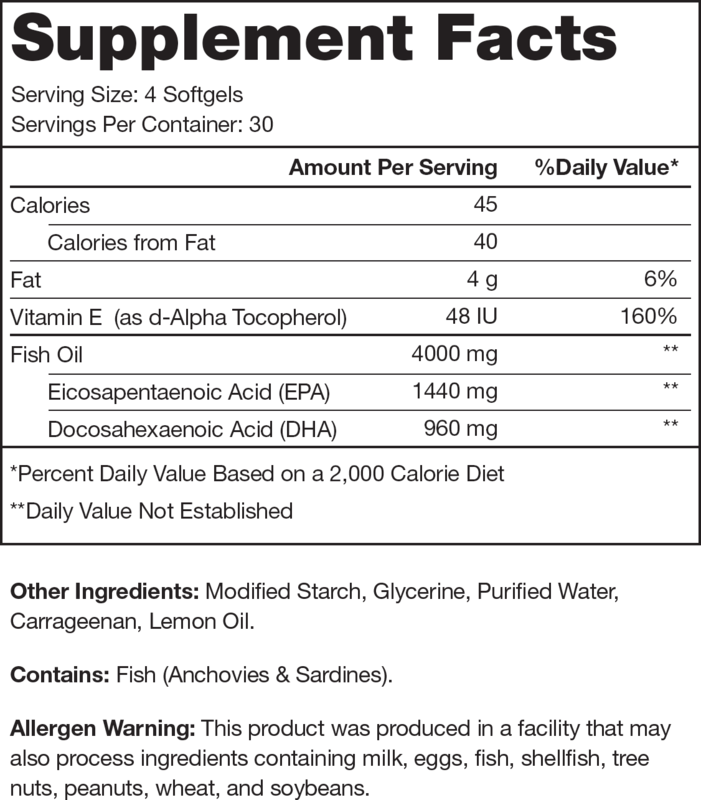 One serving of TRITON contains 2.4 grams of EPA and DHA but 4 grams of fat. What are those extra 1.6 grams? They’re omega-6 and omega-9 fatty acids (fish oil isn’t comprised of 100% omega-3 fatty acids). Is TRITON an ethyl ester or triglyceride oil? It has a very high bioavailability (~124% higher than even the natural triglyceride form and a whopping 170% higher than ethyl ester oil). It’s resistant to oxidation and thus rancidification. What’s the difference between fish oil and krill oil? Which is better? Krill oil is obtained from krill, which are small crustaceans similar to shrimp. Studies have shown that the body may absorb krill oil slightly better than fish oil, but further research has cast doubt on these findings. We chose not to sell a krill oil because we simply don’t believe it warrants the price tag (which is significantly higher than even the highest quality triglyceride fish oils). Do you need to refrigerate TRITON? Refrigerating your fish oil can extend its shelf life, but this isn’t necessary in the case of TRITON because the oil is fresh and will last up to two years at room temperature. Will TRITON give me fish oil burps? TRITON’s gels are enteric coated, which means they’re covered with a substance that helps ensure they break down in the small intestine and not the stomach (where excess gas can cause burps). If, for whatever reason, you get the dreaded burps with TRITON, keep your bottle in the freezer and take it with food and the problem should go away. I take a multivitamin. Can I benefit from TRITON? A high-quality multivitamin can plug nutritional holes in your diet and benefit your health in various ways but won’t provide you with EPA or DHA. Can I just eat fish regularly instead of taking a fish oil supplement? Yes, but you’d have to eat 1 to 2 servings of fatty fish every day to get your 2 to 3 grams of EPA and DHA every day (where you want it to be, ideally). Many people don’t enjoy fish enough to want to do this, but even if you do, there’s another problem: most fish rich in omega-3s also contain high levels of pollutants and toxins. That forces you, then, to choose between the health risks associated with inadequate omega-3 intake and those associated with ingesting too much mercury, PCBs, and other heavy metals and chemicals. Hence the popularity of high-quality fish oil supplements. They give you all the benefits of increasing EPA and DA intake. What type of gelatin is used for the caps? Why does TRITON contain carrageenan? Isn’t that bad for you? In case you’re not familiar with it, carrageenan is a powder made by boiling, filtering, and milling red seaweed, and it’s used to add thickness and viscosity to foods. That sounds harmless enough, but according to some health bloggers and “gurus,” it can cause a whole host of scary health problems. Well, research shows these claims are patently false and that food-grade carrageenan is completely safe, even at levels far higher than what’s normally found in our diets. Many of the people that claim otherwise are confused by (or unaware of) the fact that there are two types of carrageenan: undegraded carrageenan, which is what’s used in food, and degraded carrageenan, which is used in medical imaging. While undegraded carrageenan is safe to eat, degraded carrageenan isn’t because of how it’s processed. Popular health activists missed this “little” distinction and thus began the carrageenan witch hunt. Degraded carrageenan is now called poligeenan to prevent unnecessary concern by making it clear that as far as our diets are concerned, these are two very different substances. You’ll know TRITON is a real product by the results. The most common things we hear from customers are noticeable reductions in joint inflammation, improvements in mood, and better recovery from workouts. However, fish oil can reduce blood clotting and therefore is contraindicated if you’re taking blood-thinning medications, aspirin, warfarin, or clopidogrel. Should I take TRITON every day? Consistency is key with a supplement like TRITON because the longer you maintain sufficient EPA and DHA levels, the more you’re going to benefit. They are standard medium-sized softgels that go down easy. TRITON is kind of expensive. Why should I buy it over cheaper alternatives? You can certainly find cheaper fish oil supplements, but what are you getting for your money? They contain low levels of EPA and DHA in each serving. They’re ethyl ester oils, which have lower bioavailability and rancidify faster than triglyceride supplements. It contains a whopping 2.4 grams of EPA and DHA per serving. It’s a 100% reesterified triglyceride oil, which is the purest and most bioavailable form of oil you can buy. And it’s made from deepwater anchovies and sardines sustainably fished off of the shores of Peru in a fishery approved by Friend of the Sea.